Having a Cowboy Moment on the eastern shore of Long Island is impossible. It took me a full two days plus a conversation with an astute writer friend to realize that yes, indeed, it had happened. wa-wa-waaaa spaghetti western soundtrack. With honed perception, a Cowboy Moment doesn’t need these trappings. A Cowboy Moment doesn’t even need to have a cowboy in it, although it helps (once saw cowboy all in black leaning on a sign for the subway in Union Square, NYC. And he had spurs). A Cowboy Moment doesn’t need to be west of the Mississippi (although if you’ve ever seen Monument Valley, you know that’s when these Moments* come fast and furious). I step off a bus one dark and rainy evening, and plant my new used cowboy boots onto the wet macadam of a coastal town. The bus driver is taciturn or laconic, which would fit many bus drivers, but this one especially: He sports a fancy but well-worn cowboy hat, a bolo tie, turquoise and silver rings, a leather vest–buffed a smooth brown with use–and cowboy boots that are made of some kind of tough animal hide. He follows me down the steps of the bus and begins to pull bags out from the compartment and set them onto the sidewalk. “Nice skins you got there,” he tells me as I heft my bag into my arms. I know he’s not talking about anything but my boots. I pimp them out, letting the light play across their stitched shafts. I tell him that my own Urban Cowboy bought them for me, but we don’t know what kind of “skins” they are. He drops to one knee and places a heavy hand on my foot. These particular boots are thin; I can feel every finger and the palm of his hand as he kneads my leather-encased foot. I’m not sure if I feel more like a person on a massage table experiencing the weight of a masseuse’s capable hands, or like a young calf getting its testicles manipulated. His hands press and smooth each crack and bump on my boots, as well as my tired foot, from my toe to my heel. My foot erupts into warmth. He nods then stands. “Python,” he says. Python. Python. 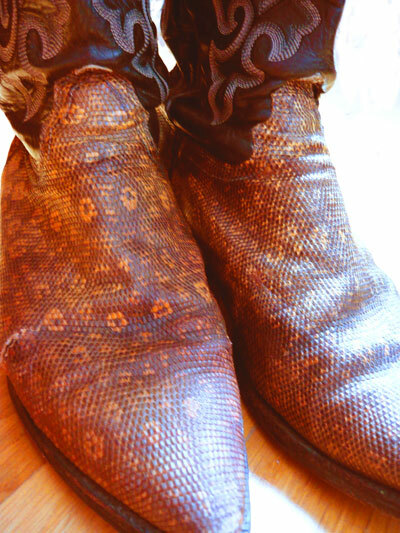 I have PYTHON BOOTS. He tells me about the rattlesnake skin he has recently tanned to put on his Harley’s console, and then details how a python’s water-loving skin feels so different to the touch from a rattlesnake. Fascinating, but what I recall most after two days and a “you know what you had there, honey? One of those cowboy moments” conversation was how he dropped to the ground, snaked out a hand, and held me tight. Yowza. *A Cowboy Moment is not to be confused with “getting western,” or a “western moment” which usually entails a near-death experience because of weather, rattlesnake, thirst, pickup truck, or cattle herd.